Handles at both ends for load retention and versatility. 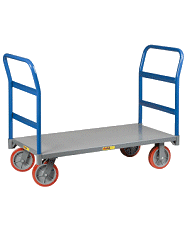 Sturdy all-welded unit is constructed of a formed 12 gauge steel deck with extra reinforcement on the underside. Two removable pipe handles are 1-5/16” O.D. and have two cross-braces. Two swivel and two rigid casters. Durable powder coated finish. Ships fully assembled and ready for use. For over 50 years, Little Giant has been providing innovative, non-powered material handling solutions. Little Giant products are manufactured in the USA by Brennan Equipment & Mfg. Inc.